Are you looking for a unique and thoughtful gift this holiday season? If you’re passionate about shopping local, or you’re interested in delicious food – The Mustard Seed Holiday Gift Bag is just the thing! This is our second year presenting these bags, and last year they were a huge hit! 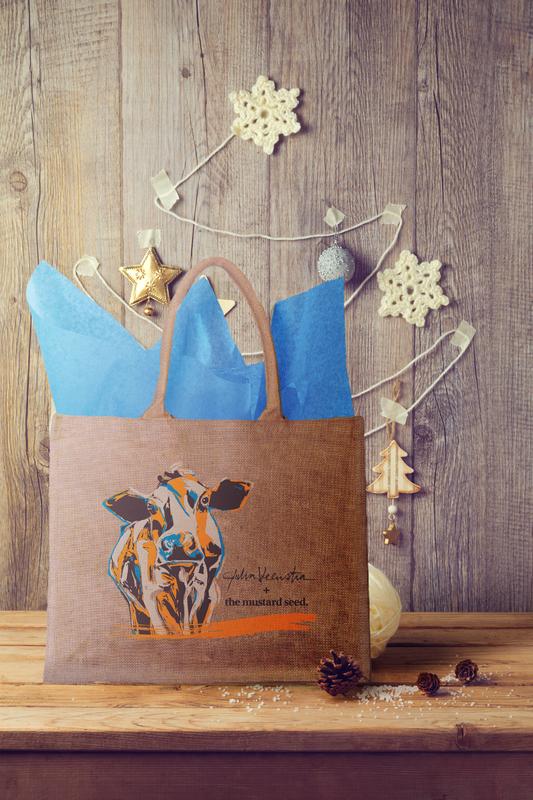 A perfect gift for a family member, friend, neighbour, or perhaps someone you don’t know as well: a teacher, a caregiver, or a local business owner – this bag will bring holiday joy to anyone! Follow this link to place an online order – or read on for more information. The items listed below come packaged in our reusable burlap shopping bags, and are ready-to-give, with vibrant tissue paper already included. This year, we’ve incorporated an extra special element, as the bags will feature artwork by local artist Julia Veenstra. Inside the bag, you’ll find a full colour version of the piece that inspired the artwork on the bags, which you can frame, hang on the fridge, or turn into a greeting card! Holiday gift bags are $55.99 each for members, and $59.99 for non-members. You can either order online, or come by the co-op and purchase your bags on the spot. Ordering online is helpful if you’d like to pay with credit card, or if you won’t be by the co-op for a few days and want to reserve some bags. To place your order online, please follow this link. There will be a small transaction fee added to your total if you order online, so again, feel free to come by the store to purchase. If you’ve got questions, feel free to email us (info@mustardseed.coop), or head over to our Facebook page to ask away! Bought one, as a gift for a special friend. What a lovely combination.